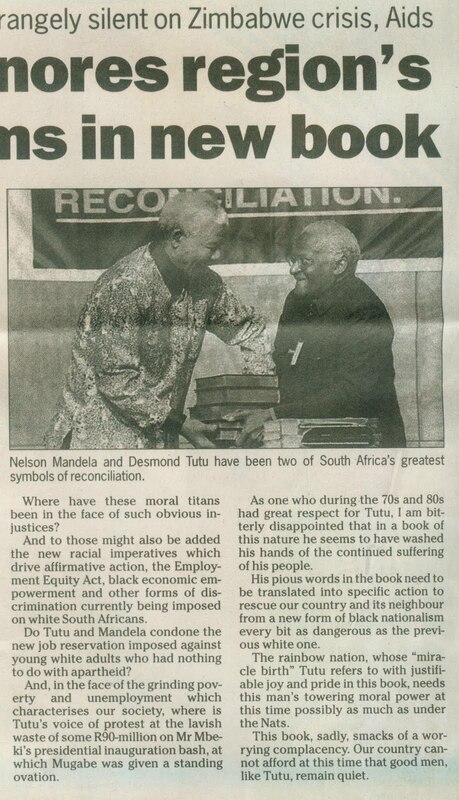 Archbishop Desmond Tutu has been in the news of late, calling on whites to pay a reparations tax for apartheid. 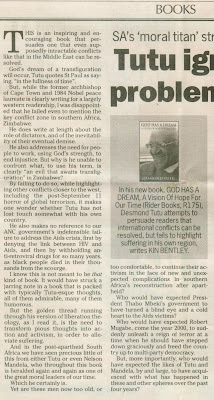 Back in 2004 I took him to task, in a book review published in the Herald, Port Elizabeth, for failing to address the festering sore of Zimbabwe on his doorstep. 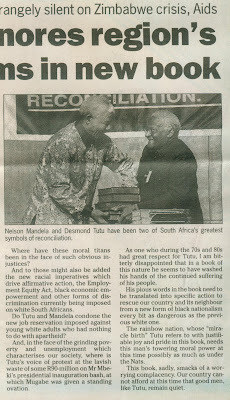 This batch of writings includes a review of an art exhibition, a feature on getting football into former white schools, a review of a book on sanctions against Mugabe's regime, a little dig at Gillian Slovo and a review of a book that puts into perspective the sort of change happening in South Africa. 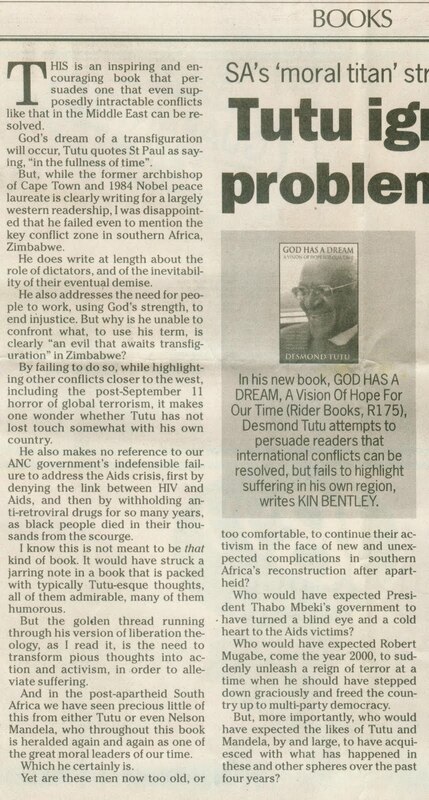 The last part of my piece on Desmond Tutu's book. 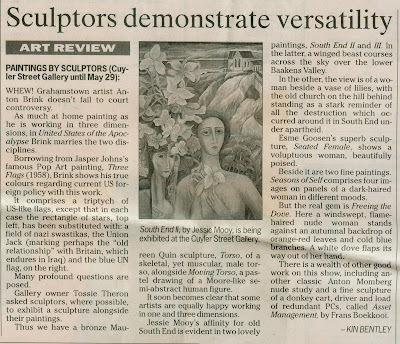 A review of an art exhibition with a very political object or two from Anton Brink, published on May 24, 2004. With two sons in primary school and the World Cup coming to South Africa in 2010, back in 2004 I campaigned for soccer to be introduced in former Model C schools. My sons' school eventually did so, which no doubt impacted on rugby. But rugby, really, is not suited to primary school because there is such a vast disparity in the size of the boys, with some virtually fully grown by 13 and others still tiny. 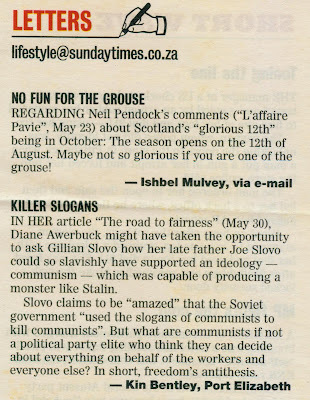 This appeared in the Herald on May 24. 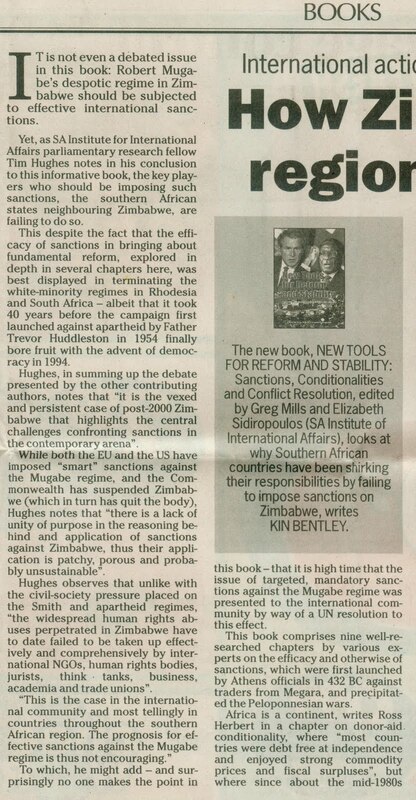 My review of New Tools for Reform and Stability, a book from the SA Institute of International Affairs, was published on May 26, 2004. It concludes below. 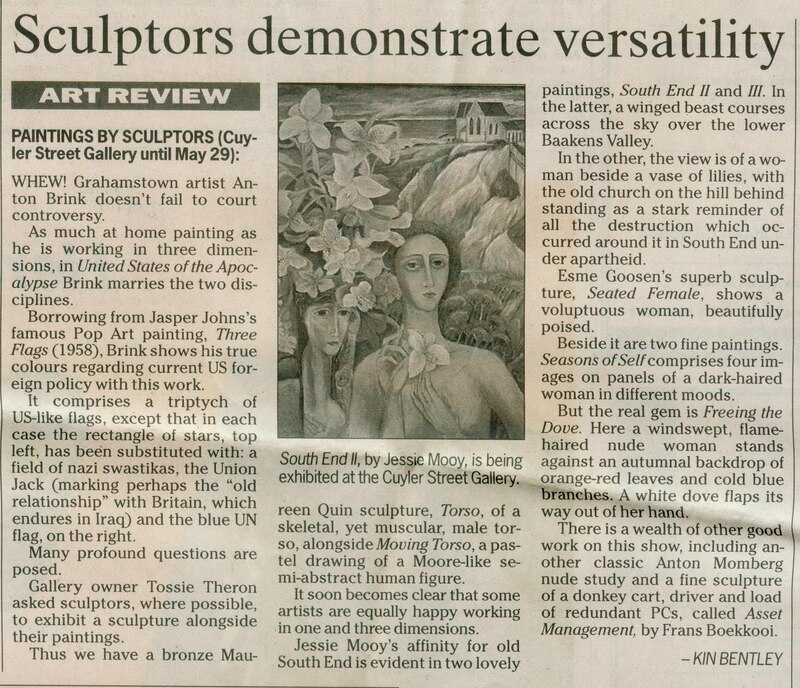 The concluding part of my review. 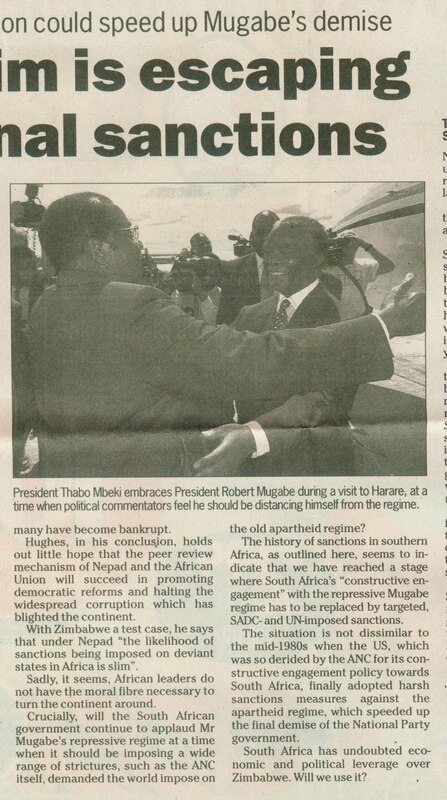 "Inspired" by images such as this, of Mbeki hugging Mugabe, I did a series of artworks at the time incorporating press photographs showing how readily Mbeki was prepared to be compromised by the Zimbabwe tyrant. When will the Arab Spring go African and reach down to that beautiful country? 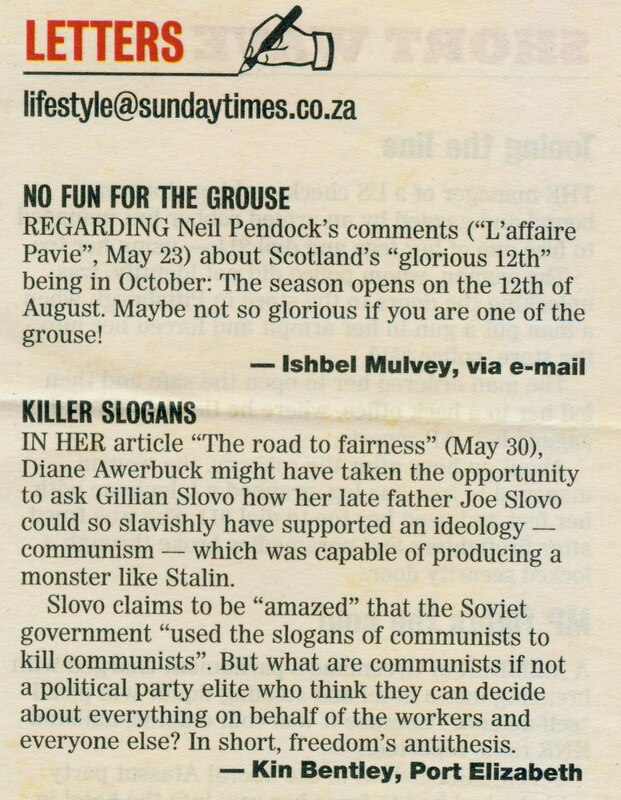 I managed to get this little dig at Joe Slovo's daughter, Gillian, into the Sunday Times's Lifestyle supplement on June 6, 2004. Amy Chua made headlines a few years ago for her views on why Asian parents turned out such high-achieving children. 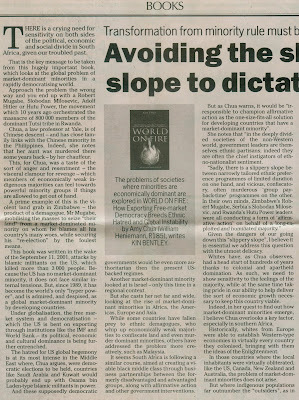 In her book, World on Fire, she tackles the tricky problem of how to manage change in countries with economically dominant minorities, like South Africa. The piece, which was published in the Herald on June 9, 2004, concludes below. 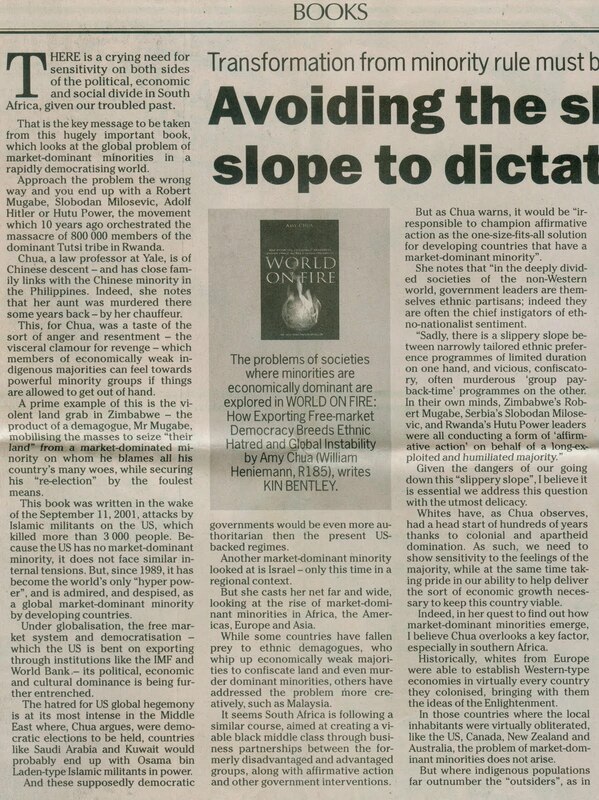 The last section of my review of World on Fire.